Nanotechnologies and Nanomaterials for Diagnostic, Conservation and Restoration of Cultural Heritage explores how advanced nanoscale techniques can help preserve artworks. The book covers lab-scale available techniques as well as advanced methods from neutron sources and X-ray spectroscopy. Other sections highlight a variety of nanomaterials with potential uses in treatments for restoration and conservation, with conservation, consolidation and long-term protection protocols analyzed in each case. The final chapter presents case studies, demonstrates how nanoscale techniques are used to conserve art, and shows what happens when misinterpretation of data sources leads to misdiagnosis. 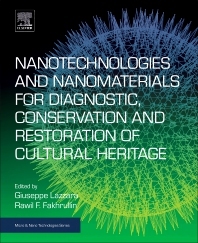 The book is intended for scientists from academic and professional conservators, restorers who are involved in the conservation of artistic and historical artifacts, and those who want to learn how nanotechnology can increase the efficiency of conservation and protection techniques. Giuseppe Lazzara is Associate Professor - Department of Physics and Chemistry, University of Palermo, Italy. He received his PhD degree, University of Palermo, Italy, in 2007. His research focuses on halloysite clay nanotubes for drug delivery, conservation of cultural heritage, bioplastics and remediation technologies. Rawil F. Fakhrullin received his MSc from Kazan State University in 2003, later receiving a PhD in Biochemistry form Kazan State University (2006), and DSc in Microbiology from Kazan Federal University (2011). He also received an MSc degree in Chemistry with Nanotechnology from University of Hull, UK. He worked as a visiting scientist at the University of Hull (UK), University of Sheffield (UK) and Yeditepe University (Istanbul, Turkey). Currently, he is an Associate Professor at the Department of Microbiology and Bionanotechnology group leader . His research interests are focused on development of novel biomimetic materials (including functionalised cells), cell-based therapy, drug delivery, controllable assembly of living cells into multicellular clusters, fabrication of cell-based biosensors, and nanotoxicity.